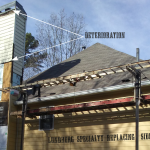 Lundberg Specialty Services > Company News > Roofing > roof ventilation > Roof Leaking! Absolutely Positive? Roof leaking! Are you absolutely positive? 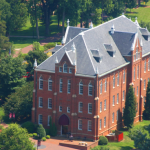 As a Charlotte roof contractor, we tell you how you might figure out if you have a roof leak or not and where to find the source. Follow the water to find a roof leak when you are trying to find its’ source. Many times, where the roof is leaking may not be where it originates. You may even consider, thinking backward, because as you know, water flows down. 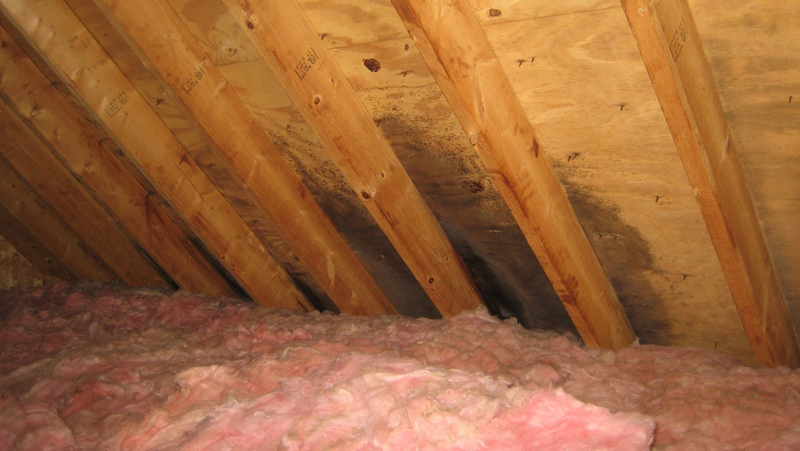 While carefully stepping on the rafters in the attic, use a bright flashlight, starting above the leaking area and head upward along the rafters and framework to look for drips, water marks or stains. If no luck, steady yourself and try turning the flashlight off to see where daylight may show through the roof. You might even get quiet as a mouse and listen for the water dripping. Worn, loose, rotted or missing shingles often happens when nails have worked loose or when the shingles break down to age. 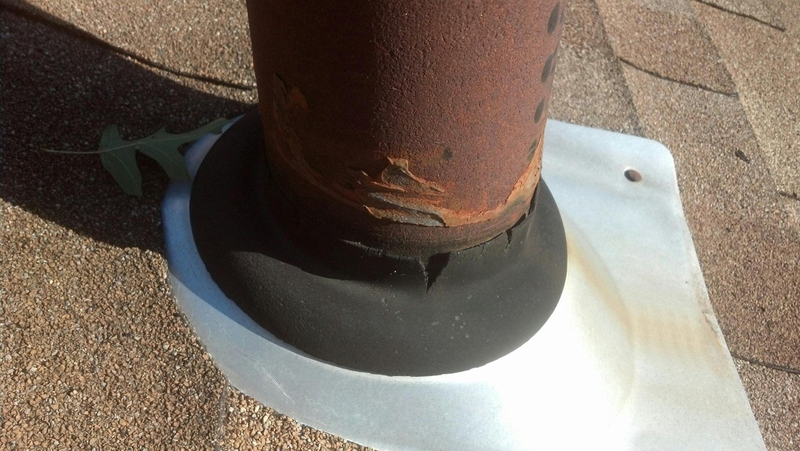 Poorly sealed roof flashing around vents, skylights or chimney’s. Cracks around plumbing vent. 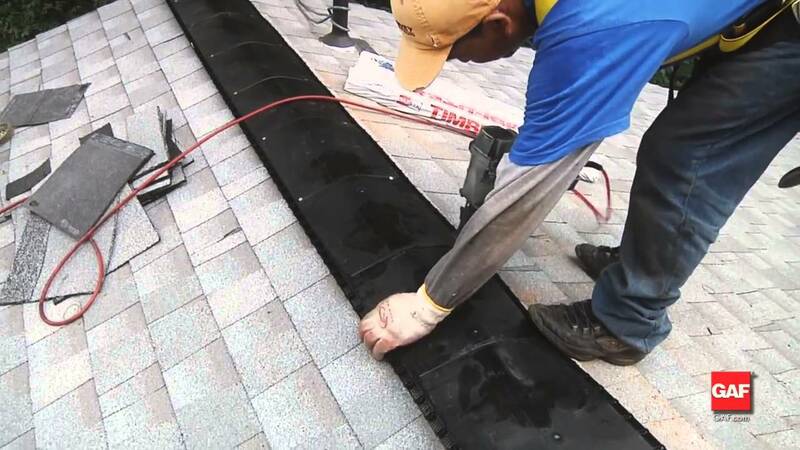 Most vents are enclosed by a rubber boot, but eventually the exposure to sun will break down the rubber and cause cracks..
No outside roof leaking? How about improper ventilation? 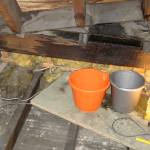 Strangely enough, if there has been no recent rain and the temperatures have been on the upside, then it could be a roof ventilation problem, instead of roof leaking. Like people, a roof can get hot, resulting in sweat and smells. Does your attic smell musty? Improper roof ventilation can lead to musty smells and for some roof types, could even lead to a voided warranty. Today, roof ventilation in the attic is required by most building codes. There is even a standard calculation of how much ventilation you need. To find out more about the calculations look at the National Roofing Contractors Association or contact your local municipality to check on the building code. Basically, intake vents allow the outside air to enter an attic space, outtake vents allow air to exit and insulation acts as a vapor barrier. Why is good circulation in your attic so important? Good circulation of air is important during the winter and summer months. Seems like a contradiction, right? In summers and cold wet winters, warm air and moisture builds up in the attic and greatly reduces the effectiveness of insulation. 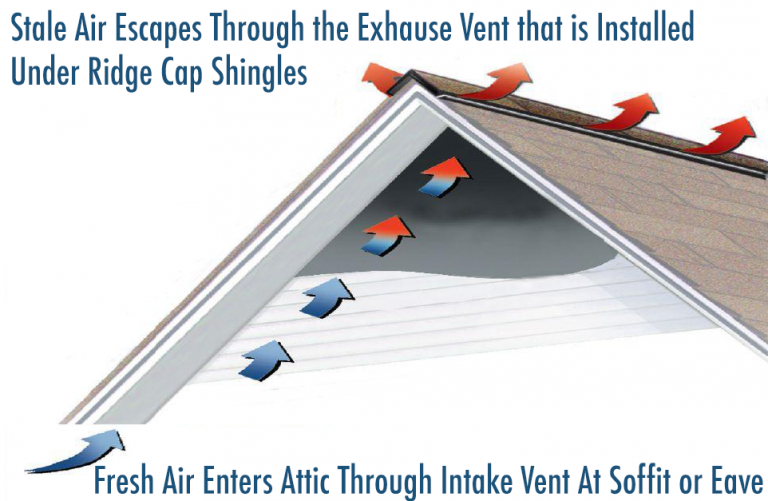 Ridge vents coupled with soffit vents do more for the ventilation of your attic than any other ventilation options. 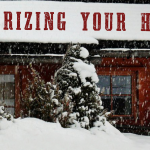 As air heats your attic, the warm rises, which in turn pulls fresh cooler air from the soffit vents causing the hot air to escape through the ridge vent. This greatly reduces the overall temperature of your attic, thus reducing the temperature of your home, which ultimately reduces your energy bills! If you have the old turbine vent, you may want to upgrade to the vented ridges because turbines loose their effectiveness or quit working over time and can also cause rain to get in at the entry point. Finding out about a roof leaking is not for the faint of heart.. There are more roofing accidents probably then any other do-it-yourself type job. More often, then not, falling on your back is the most common injury and can cause you problems for the rest of your life. 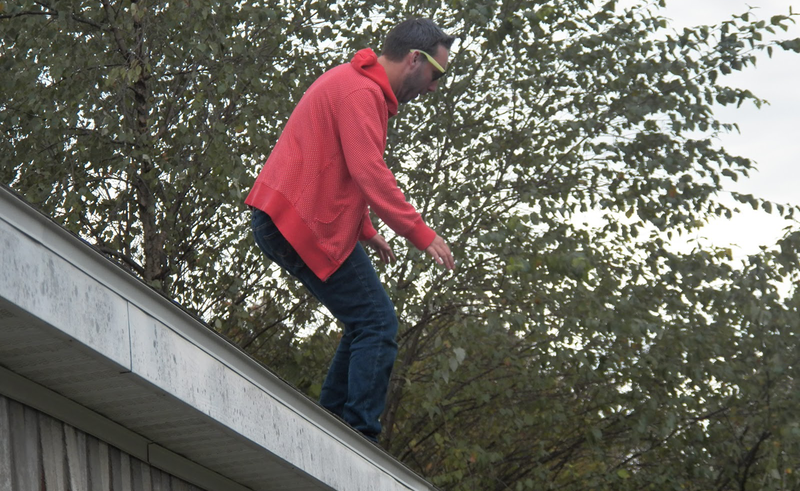 A little investigation of where the roof leaking might occur in the attic is one thing, but getting on top of a roof to look for the leak or to try to repair it is risky business. 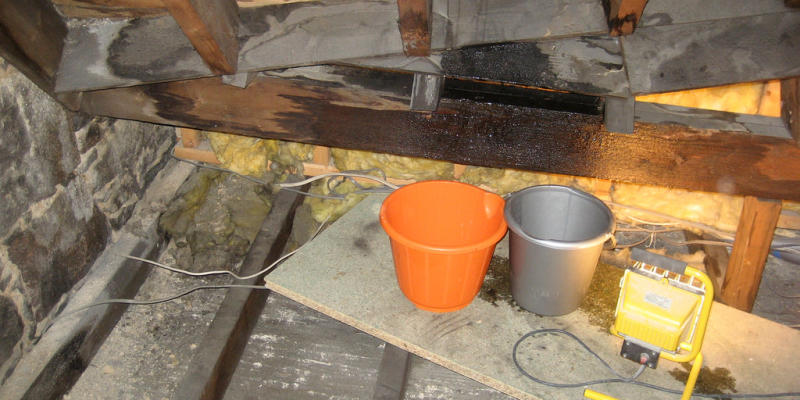 Putting a bucket under the water leak should be good enough, until you can call Lundberg Specialty to verify your leaking roof. Bonus: you won’t get hurt, you will get the right repair type and if you need some ventilation, they will do all the calculations needed to get just the right amount to fix it correctly. It is a lot more technical then one would think. So my advice, follow the water to find the leak, inside your house, but let the pro’s take it from there! Here is more about Lundberg Specialty Residential Roofing and Lundberg Specialty Commercial Roofing. Also, Lundberg Specialty is certified as a GAF Master Select Roofing Contractor. Checkout the GAF Cobra Attic Ventilation– effective ventilation for the long haul. Link to Lundberg Contact Page.